We’ve all walked down the street and seen someone with a weird tattoo and thought, “they’re going to regret that later”. What may seem cool at the time, might not seem so cool years from now. Is it possible that the current crop of mobile photo filters will lead to the same type of regret? PicPlz clearly thinks it’s possible. 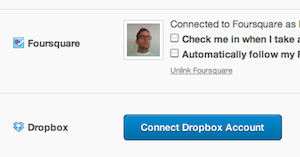 A new feature the service announced today is Dropbox integration. This nifty ability has been turned on from the backend, so iPhone, Android, and web users can use it immediately. And if you do use it, you’ll be able to automatically save both your original photo and your filtered photo to your Dropbox account in the cloud. It’s a cool integration that’s a good idea. I’m sure we’ll see more mobile services utilize it. While PicPlz, like rivals Instagram and Hipstamatic, is built around the idea of taking and sharing photos that have been altered using filters, they’re also clearly aware that some users are hesitant to do this. In fact, there’s no shortage of people who think this type of behavior is simple a fad that will pass. And then we’ll all be longing for our original, unfiltered pictures — we’ll want to remove the tattoos. Whether that’s true or not remains to be seen. Plus, both PicPlz and Instagram have already allowed you to save both the original version of a picture and the filtered version. But this new integration does make it a bit easier to not think about.